This tiny treasure apparently fell out of his nest sometime last night or yesterday. Our chihuahua barked for 10 minutes trying to get our attention- finally I told Luke to go check out what he was barking at. 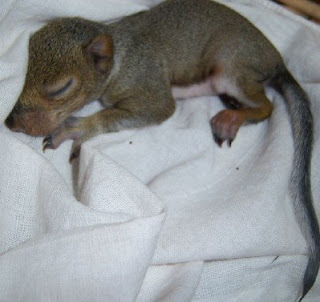 This is what he found- a tiny baby squirrel. I think his eyes should be open in a few days-if he gains his strength back. Ya just never know what treasure you'll find in the woods. 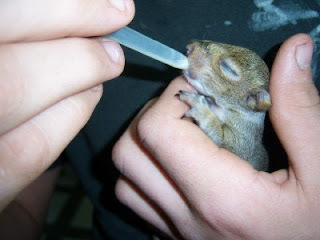 How lucky for this little squirrel that he fell into your arms! A little treasure for sure. Awwww. the bebe!! How's it doing? It's so young, I sure hope it thrives with all of your love and nourishment. Hey, come visit me for Pink Saturday..there's something there you may like to have!